The afterglow of knowing your team is champion of the baseball world is a pretty damn cool thing. I have been walking around the last few days in a sort of “Happy Flight” daze. I’ve been smiling more. I feel fantastic. But yesterday morning, reality hit me: there won’t be any more baseball for a looooooooong time. And then the text messages started coming. OMG Tony is hangin’ em up. Are you okay? I just heard about TLR. When Tony LaRussa took over the St. Louis Cardinals in 1996, I was just an awkward, acne-plagued high schooler who nerded out on keeping score at baseball games. Now, 16 years later, I’m an awkward, 32 year-old professional who nerds out on keeping score at baseball games. Not much has changed, yet much has changed. In the early 90s, the Cardinals weren’t very good. But from the minute the announcement was made that he would be the new St. Louis skipper, I immediately had a new found sense of… hope. It was innate. It was from within. I don’t know why, but I just knew: our team was going to be good. And we were! From 1996 to the present, there hasn’t been one year where I didn’t think the Cardinals had a legitimate shot at the postseason. Sure, some years were better than others, but with Tony at the helm, I have always had a sort of calm about the team. That’s not to say he hasn’t made me scratch my head. But I soon learned to stop questioning his umteenth pitching change. His post-game explanation always made sense. Our pitcher is hitting in the eight hole? Of course he is. Bringing in the closer in the 5th inning? Exactly what I would do. In fact, I learned very early on that if I was going to keep score during a TLR managed game, then I was going to have to a) write small b) write small and c) WRITE SMALL. 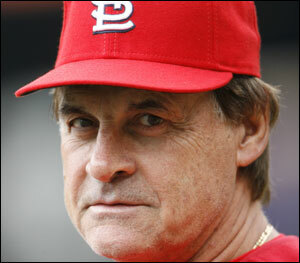 Still, I am going to miss Tony LaRussa. A lot. Just thinking about someone else being in the dugout with his job gives me the creeps. My happy place is Tony giving the sign to Yadi. Yadi fires down to first. Albert makes the tag on the runner. And right now, in light of TLR’s announcement and the ongoing question of whether or not Albert will be back in St. Louis next year, my happy place suddenly finds itself under baseball siege. But, like everything else in life, I will just have to deal with that shizz when it comes. In the meantime, I sure hope Tony doesn’t consider becoming an actor. I have been suffering through the Ray Vinson commercials long enough. Hate me ‘cuz I’m gettin’ misty eyed, just don’t hate me ‘cuz I’m right. It’s a tough one. One thing’s for sure- there was always intrigue with TLR in the dugout. And you knew they’d always have a decent team. They’ve been under .500, what, one time since the end of the ’99 season? For sixteen years, the guy poured his blood, sweat, and tears into making Cardinal Nation as happy as can be and I will always admire and respect that. I’d add that his teams dominate the bulk of my memories of Cardinal baseball, and I even grew up in the Herzog years (I’m 35). Totally agree. We’re close in age and I grew up under the Herzog years too but I associate with Tony’s clubs way more now. In a weird way, I feel like Tony taught me the game. I loved TLR’s comment that he might open a bookstore. HAHA. Would it be a store that only sells books about baseball and animals? Jane — Definitely! I can see it now! A whole wall dedicated to She-Fan titles! No LaRussa, Francona probably taking a year off at least from managing and discussions of a Cubs icon taking over the manager’s position for the Cards? 2012 is going to look seriously strange. Oh, and I too loved LaRussa talking about starting a bookstore. Yay independent bookstores! Toosoxy — Francona is cool in my book, but the Ryno thing is really intriguing to me. Kristen — If Francona does take a year off I hope he goes into broadcasting. He was the best thing that happened to FOX baseball since the late Jack Buck reigned supreme. I have never been a fan of TLR. I could go into a ton of reasons why too, but ultimately, he knew how to win and went out on top. That was a classy move….even if I don’t like him. I can see why you wouldn’t be a fan of his, Ron (CUBS *ahem*), but yes, the man is a class act. No doubt. And he took the Elway exit. Gotta appreciate that. Don’t Give Me That Sanctity Crap!